Soon the new Monkees album will be officially released. Already there are four tracks circulating from She Makes Me Laugh, You Bring Summer, Me and Magdelena, and recently Whatever's Right. This is exciting for fans, a BRAND NEW Monkees album coming out. Do you know have exciting this is? Okay, yes I am a Monkees fan, and yes, I am looking forward to the new album. How did you guess? Good Times! is the name of the new album releases May 27th. You can pre-order it on amazon and the mp3's are available on Amazon and iTunes. Why, Dear Readers, should you consider this album then? Well, because if you are a Monkees fan it will feel like a Monkees album, but it will also be a unique collaboration of old and new. Truthfully, am not as familiar with the newer albums like Justus (You and I) and Pool It! (Every Step of the Way and Heart and Soul). I was introduced to just the hits from the 80's and 90's era, and of course the classics like Last Train to Clarkville and Daydream Believer. Good Times! is something reminiscent of their sound from the 60's. It is refreshing to hear Monkees song channeling the era whence they were spawned, and not trying to sound like there are modern or too from the 80's or 90's. Something exciting about Good Times! is that a few of the the songs were written by modern artists, Rivers Cuomo of Weezer fame wrote the first track to be released, She Makes Me Laugh. Other featured writers Ben Giddard (Death Cab for Cutie) on Me and Magdalena, Noel Gallaghar and Paul Weller (Oasis) on Birth of a Accidental Hipster, sung Mike and some Mickey, Andy Partridge (XTC) on You Bring The Summer, along with tracks from Boyce and Hart on Whatever's Right, and Goffen and King on Wasn't Born to Follow, sung by Peter Tork, the staple of Monkee songwriting in the 60's. It's a real throw back with these songs. 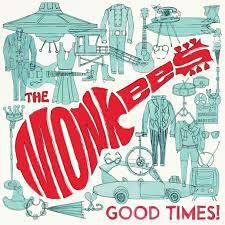 "The most genuinely Monkee-sounding music they've made since they broke up, really. They're not trying to be an eighties band like with Pool It, or a grunge band like with Justus. The guys are working with a team of people who care about that vintage sound (writers from Weezer, Oasis, and Fountains of Wayne), and it shows." Of the tracks released on Amazon and iTunes my favourite is Me and Magdalena. 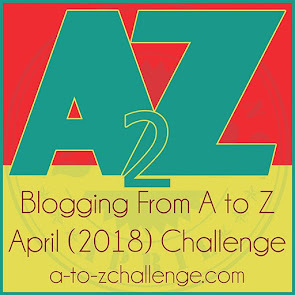 A Mike Nesmith track, it feel like a Nez track, smooth and mellow. It's very Zen like. I have always love the way Mike's sings and gets lost in and I loved it after the first listen. I have become fond of Nez's soft and lilting vocals and I think it will continue to be a favourite. I cannot forget She Makes Me Laugh, its a Mickey track and Mickey is my favourite Monkee and I can almost picture it playing during an episode, or at the end. Better than Star Collector any day. Sorry, Star Collector isn't my favourite Monkee song, in fact it was over played during the show's run. I know its a regular on the show, but it was jarring and sync heavy. Anyway, that is NOT why we are here. The four tracks all have a charm, a resonance of the pure Monkees that hasn't been heard since Head (so folks say). I think its a fun album and cannot wait for next week's release. For a more detail review check out this REVIEW. Thoughts on The Muppets. What now?!?! I've been going around and around what to write about this. I didn't want to rant or whine about The Muppets cancellation. It is true that I was bummed when I saw the headlines, and even more bummed as time passed, but there's more to it. It was exciting to see the Muppets in prime-time. Now Muppet fan are left disappointed, confused, and feeling like there might never be Muppet based show in prime-time, after all Muppets Tonight was also only ran 10 episodes (season 1) and later all 22 on Disney (season 2) in the late 90's. And then there was The Jim Henson Hour in 1989 where only 9 out of 12 episodes aired. There were some who were hoping that The Muppets would break the prime-time curse and go a second season. This is why many Muppet fans were sadden by the cancellation, including me. For my part I was just happy to see the Muppets being funny and relevant again. See, Dear Readers, I can be sad that the ABC Network chose not to renew The Muppets, leaving us with a muppet-less prime time, but I can also think about the possibilities for the Muppets in the future. There will more opportunities I am sure of it, maybe a movie or more internet based Muppets via YouTube. I want to focus on the positive. First, I can say that if Jim Henson was still alive he would have loved the new show. He always talked (in his biography by Brian Jay Jones) that he wanted the Muppets to be for adults. He didn't want to be labeled as children's performer. As an experimental film maker and comedic genius with puppets Jim was always thinking outside the box. I thinks that's a good sign that the show would have worked. Also, after thoughtful repose, I think that to trust that only one season is a mark of a show is rather lofty ideals from ABC. Did you know, Dear Readers, that in the first season of The Muppet Show, Bernie Brillstein, Jim's agent, he asked favours of friends for the first few guest stars. Not all great shows, actors, concepts are breakout hits. Now this leaves Muppet fans a little disillusioned about what will be next for a favourite monster, frogs, bears, pigs, and whatevers. There are those, at least from those I have talked to about The Muppets cancellation, who didn't like the show. It wasn't their flavour, or not kid -friendly enough, or even they weren't that into the Muppets. While others are sitting on their beds, sofa, and dinner room tables wondering how could the Muppets not succeed. I will always wonder myself. Wondering if Netflix would consider picking them up (Thanks Tough Pigs for the suggestion. *Hint Hint Netflix*), of course I wonder at the fate of the Muppets too. Being owned by Disney, think about this, Dear Readers, if Disney can bring back the Star Wars franchise from the brink, then maybe Disney can work magic with Kermit, Piggy, Gonzo, Pepe, and Uncle Deadly. 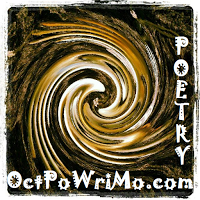 At the time I write this blog, the renewing the new show The Muppets is up in the air. Some say it it is renewed, while others are not so convinced. There was some hesitancy here, Dear Readers. The Muppets new show has met with mixed feelings. I do admit that I had some hesitancy early on in the season. I wasn't sure if I liked it, but I kept watching. I chanced my mind, there was a charm with the show. 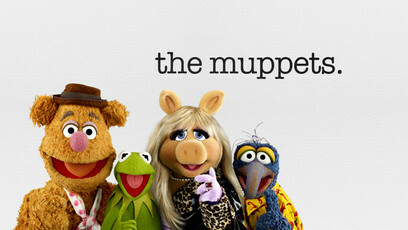 Its been an quandary all across the internet whether this modern spin on the Muppets would survive to see a season 2. I was concerned that it wouldn't happen. If The Muppets would not be picked up for a second season, what would happen next? As of April 26th it appears that The Muppets are currently "staying alive", according to Variety. The final decision for renewal or cancellation won't be handed out until May 16th, though. So what are we to do until then? 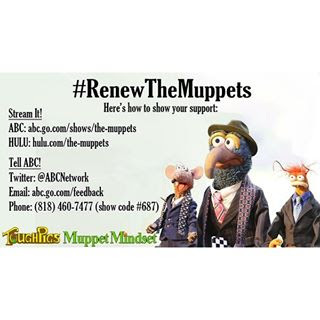 Suggestions from Tough Pigs-which is a prime source for Muppet news-is to stream episodes on ABC's website, buy the episodes on Amazon and Hulu, and spread the word about The Muppets by using the hashtag, #RenewtheMuppets on social media. Let's get the attention of ABC execs to officially renew The Muppets. See, Dear Readers, there are a number of reasons to renew The Muppets. *They are the Muppets! The are an institution. They are a staple to entertainment, from Sesame Street to the The Muppet Show, and have been around for forever, When the first Muppet Show came out it was in prime time and geared more for adults, but also had kid sensibilities. You see Jim Henson's original idea for the Muppets were to showcase puppets for adults and he spent many years trying to prove that to TV producers and execs. He started doing puppetry in the in college, and got a chance to do bits on a local station WRC-TV, Sam and Friends (1955) became a time. That later became commercials selling coffee and various guest spots on shows like The Ed Sullivan Show and The Jimmy Dean Show, these became the precursor to The Muppet Show and what would become The Muppets. 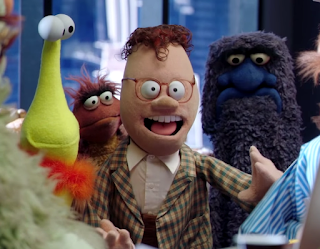 Henson's strong desire to make puppets adult based was always present, so, it is not surprising that the current incarnation is a more adult oriented show. *The Muppets are relevant again. Its been a few years since the last Muppet related show. Oh, there have been movies and specials, but now there is a new show with new stories. Something new for them play in, new stories to tell, and also they have brought back long forgotten characters like Uncle Deadly. He is now a household name, and he is a personal favourite of mine. There is of course Kermit and Piggy, center stage in a fantastic story of love and loss. Even I can admit the chemistry has been different, but good, more so since the mid-season re-vamp. I was rooting for Kermit and Denise in the beginning (I was always bothered by Kermit and Piggy as a thing), but after the mid-season I could see that Kermit and Piggy were just as powerful after all these years. 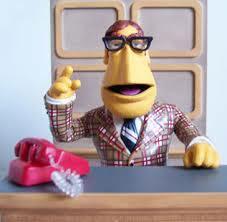 Other characters not part of the main line up that have been brought back and are now becoming A and B-list Muppet characters include the Muppet Newsman (The Muppet Show), Big Mean Carl (from Muppets Tonight! ), Chip (Jim Henson Hour - 1989, Muppets Tonight, and some of the recent movies), and Yolanda (Rizzo's girlfriend). Also, they are utilizing characters to a fuller potential and comedy gold, such as Rizzo and Pepe (the King Prawn, okay?). These characters are becoming the new backbone for the series, and with new stories it is not surprising that many are piqued by the prospect of more Muppets. It is something different, yes, but that isn't bad. They are also using the main characters we know and love. It makes me rather excited for the potential of season 2, since the chances to the show at mid-season, making more skits and musical numbers part of the show. Fun fact: Uncle Deadly first appeared in the Vincent Price episode of The Muppet Show in 1976 as his beautiful assistant, but not formally introduced until the Twiggy episode (#119) as the Phantom of the Muppet Show (he claims to be a deceased actor killed by acting critics). Then in 1979, Deadly was featured in Muppet Madness (or Muppet Show Annual in the UK) as the evil step-father in a Cinderella parody featuring Kermit, and in a board game in the publication. He didn't reappear until the movie The Muppets (2011) as one of Tex Richman's goons for hire along with Bobo the Bear. 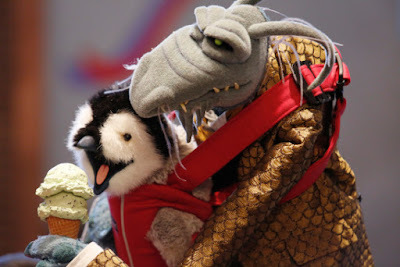 "Maniacal Laugh, Maniacal Laugh..." And the best part is Deadly with little Gloria Estefan the penguin. The show has improved. See, Dear Readers, earlier on it seemed that lots of people were surprised and maybe slightly disillusioned by the new format. But, when they changed the show runner and starting writing more for The Muppets, there was pleasant shift in the episodes. Almost hearkening back to something of The Muppet Show in a way. There were more skits and songs, and better use of the guest stars. More Muppet characters were returning, adding to a fuller feeling to to show. And the there's the Piggy problem. I have always had a love/hate relationship with Piggy, and I never really liked the Kermit and Piggy thing. It drove me crazy, but then when it wasn't a thing anymore I realized I missed it. Now its a show about the Muppets (as real people) with real struggles, and I am okay with that. There is something entertaining about that. It works and thus ABC should renew it. *The Muppets are not going anywhere. The good thing about Disney owning the Muppets are that Disney's will (hopefully) not let them disappear. They are currently on YouTube, check out their site, here. There are also YouTube channels for Statler and Waldorf, Swedish Chef, Fozzie, Sam the Eagle, Beeker, and Gonzo. I am not sure how often those channels are update, but check them out anyway, there is some good stuff there. But the Muppets, they can do live appearances which makes them very versatile. So I think they, will be around for a long time. So, Dear Readers, let's get the attention of those at ABC and tell them we want more Muppets, and this will also show Disney that Muppets are loved and need to be utilized in more ways. I am sure there will be specials and movies. You can't let something that was a labour of love for a man with dreams of making wonderful things, and creatures that blow up or are eaten as Jim Henson just disappear. That was Jim's favourite part of the Muppets, ending a skit or a commercial, involved some Muppet either getting eaten or blown up. 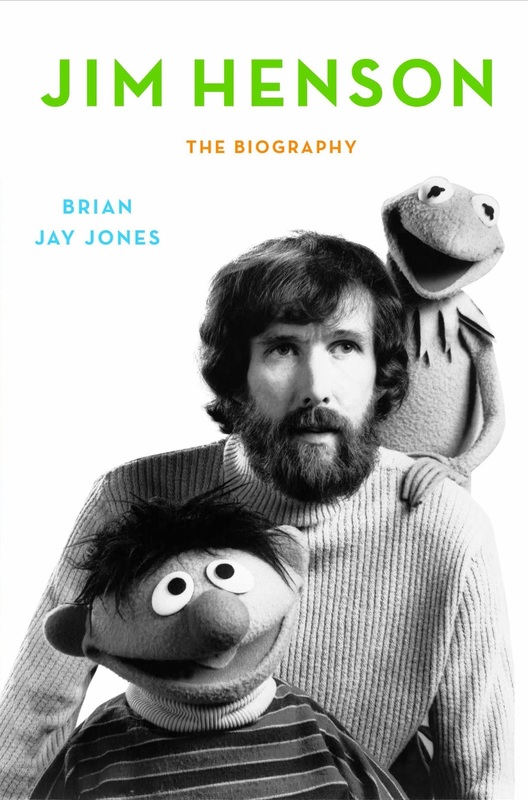 The biography, Jim Henson, written by Brian Jay Jones is really a fascinating read. I have learned more about Jim Henson in that one book than I even knew of him before, and I am only halfway finish with it. 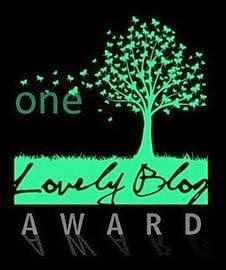 Well at the time this blog was written. Fact: Jim Henson loved making movies, but not always with Muppets or puppets. He was an experimental film maker and made a couple of movie featuring new and different film and animation techniques, including Youth 68, Time Piece, and The Cube (thee are clips). Also, check out The Jim Henson Company YouTube channel for bits on some of his other works, Muppet or not. Fact: Jim Henson wanted to design sets and do production work for theatre. That was in major in college, theatrical design. Fact: He just picked up a book on puppetry and taught himself as a means to get on TV. Fact: Jim Henson was a spiritual man and was into transcendental mediation, reincarnation, and new age thoughts. He was brought up in the Christian Science faith, but I think he saw the world as bigger than religion and faith. Remember to support the Muppets and leave me some love in the comments. 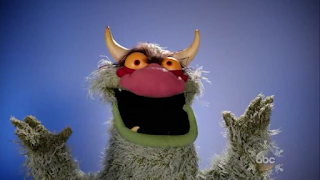 What is your favourite Muppet related thing? 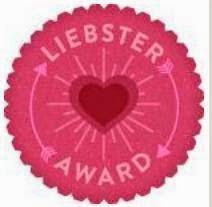 Favourite non-Muppet thing? Was Jim Henson a big part of your childhood, your life?